Our headless male soccer mannequin is super fit. In an action kicking pose with a gloss white finish, he will add excitement and athleticism to any display. Made of fiberglass. Base included. 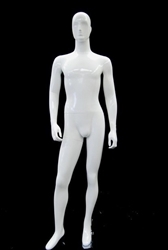 Mannequin comes in gloss white or Matt black. Click here to see the matte black kicking soccer male mannequin.